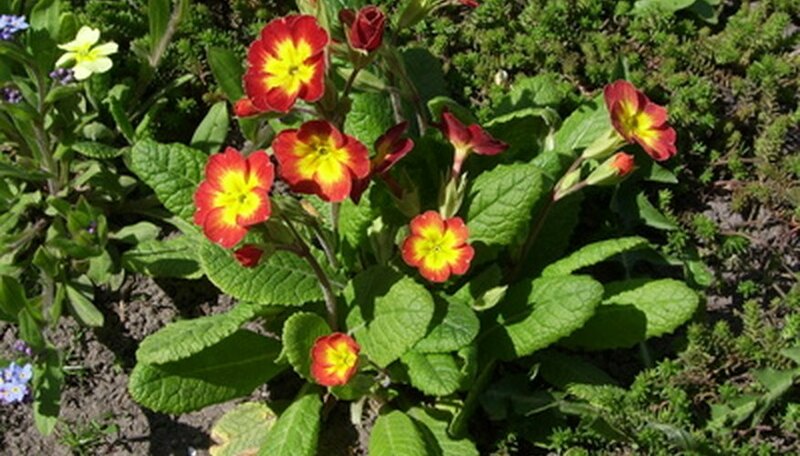 Consider the bright and flashy primrose flower if you have a sunny garden patch in need of vibrant color. Primrose plants are available in a wide variety of colors and the flowers give off a delightful scent as the primrose blossoms throughout the entire growing season. With minimal care, your primrose plants will thrive from year to year to bring lasting beauty to your sunny flower beds. Prepare the sunny planting area in the spring when the growing season begins. Cultivate the soil with the garden spade down to a depth of approximately 4 inches. Add 2 inches of compost to the top of the soil and work this in well with the garden spade to incorporate the compost with the soil fully. Rake the soil smooth and level with the rake. Sprinkle primrose seeds lightly over the soil. Check specific planting instructions on the seed packet for seed spacing, if possible. Lacking this information, plant the seeds 1 foot apart in the planting area. Cover each seed with approximately ¼ inch of fine soil. Water the newly planted primrose seeds lightly immediately after you plant them to moisten the soil. Keep the soil evenly moist while the seeds germinate. Water the primrose throughout the season during drought conditions; otherwise, primrose plants need little water. Pinch off the spent blossoms when they fade on the stems. By deadheading the primrose plants, you encourage continued blossoming throughout the entire growing season. Divide primrose plants in the autumn after the blossoming for the growing season ends. Dig up the primrose plants and separate the clumps into pieces 3 to 4 inches across. Replant some of the primrose plants in the same growing location and relocate other plants in other sunny growing areas. Keep the newly divided primrose plants evenly watered for two to three weeks after dividing them to minimize shock and help the plants acclimate to the change. Primroses need little winter care. Mulch and pruning are not necessary to ensure their safety throughout the winter.